“Lebanon’s pro-government and opposition factions, have reached a deal to revoke two decisions that resulted in fierce gun battles in Beirut, the Lebanese capital, last week. The violence was sparked when the government issued an order to dismantle Hezbollah’s communications system, and to sack the head of airport security. 1) This must be the first time in history the Arab League has ever produced anything other than empty rhetoric, wasted time and money. Well done, you can pat yourselves on the backs now! 2) How embarrassing that the Lebanese must always either ask for help from foreign powers, have it imposed on them or just be walked all over by foreigners. It’s time the Lebanese started using their own brains and start finding their own solutions to the problems they have a lot of responsibility in creating. This visit was no more than symbolic, to deliver the Lebanese government the hard kick up the arse it seems to need before it can make any sort of decision. Everyone knew what the Arab League was going to suggest- it wasn’t exactly rocket science. The suggestion was proposed ages ago. 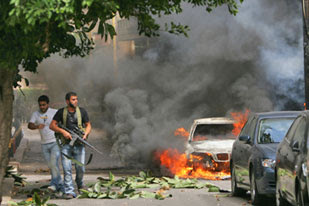 Lebanon’s political and security situation is set to deteriorate further, it seems. At work today (I work at a newspaper), there was a noticeable, if quiet, atmosphere of panic. Hizbullah has taken control of Beirut international airport and is setting up protest tents similar to the ones that haunt Down Town, saying they will stay there until the government revokes its plans to crack down on the Shiite political opposition group. Violent clashes between armed pro-government and opposition supporters have been reported throughout the country. Walking home from work, I was one of very few people out and felt somewhat intimidated by the swarms of young soldiers staring boredly at me, playing with their guns and putting up even more barbed wire around government buildings. On the other hand, there were camerapersons and journalists out in the tens, with foreign correspondents setting up shop on most corners, next to a handily placed tank to provide a good visual backdrop. Once in my neighbourhood, I decided to join the mass hysteria by going panic-food shopping. My dad had done it a few days ago and I had laughed, shrugging off his fatalistic outlook of the political situation. But when I myself arrived at the supermarket it was virtual pandemonium and I began to feel a little tense- the queues of people buying canned goods, bottled water and sanitary towels were absurd. One old man was buying five boxes of hair dye, an odd purchase I thought at a time of potential conflict. But most people were shopping seriously, and in bulk. I got into a fight with an older woman pushing and shoving me out of the way, as everyone was bustling to get to cash registers first. People here seem scared, more than I’ve ever noticed, and are preparing for the worst. Hassan Nasrallah, head of Hizbullah, is speaking on television at 4pm Lebanon time. His political rival Saad Hariri (of March 14 Coalition and the Sunni, US/Saudi-backed Future movement) is also due to give a news conference today. Almost no one will be on the streets after 4pm and only time will tell what happens after that. So, with little else to do, I’m going to enjoy my current supply of electricity and gas, my water and excess of food while it all lasts, and settle down to watch angry politician after angry politician deliver their verdict on why this tiny country is in the royal mess it is in. It may seem a little peverse for me to be talking about the days events in Lebanon at a time when over (at least) 15,000 people in Burma/’Myanmar’ are dead and thousands more missing after a huge cyclone, but this blog is, after all, about the Arab world and thus my world. And yet I can’t ignore the terrible catastrophe that has befallen those innocent people already suffering under a bonkers military junta and so I have to at least give my respects to the victims. The Burmese military rulers are only allowing in a pathetic trickle of aid: valuing politics and their positions more than their people’s lives. More should be done for the people- more should always be done. So as for the Arab world: Beirut was today transformed from a hustling, bustling, car-crammed city into a virtual ghost town. There were almost no people out, no cars, very few shops open, and an unnerving quiet most alien to the capital. The General Confederation of Labour Unions (CGTL) had organized a strike, with the backing of the opposition, to demand the government increase the minimum wage from $200, which has been in effect since 1996. Of course, as is usual in Lebanon, what started as a strike over living conditions then became riots in certain areas, with teenage boys burning cars, tyres (and I think I even saw a carpet on TV), looking for fights and egging on riot police. An important call to demand the poorer sections of Lebanese society get better wages to meet increasing food and living costs therfore became a complete farce, was completely politicized and played into the hysteric scare-mongering that politicians here are so fond of. It seems that the March 8 ‘opposition’, essentially Shiite Hizbullah and Amal, together with their Christian ally the Free Patriotic Movement, have hijacked the protests and say they will continue until the government repeals a decision to shut down Hizbullah’s phone networks.That decision was triggered by Walid Jumblatt, Druze leader and head of the Progressive Socialist Party (the leadership of which inherited from his assassinated father), who earlier this week ‘outed’ Hizbullah’s network, which was in fact public knowledge years ago. Jumblatt also accused Hizbullah of having surveillance cameras trained on Beirut airport’s runway 17 , which alot of politicians and private planes use. The government also returned the head of the airport’s security to an army position for his links to Hizbullah. March 14, of which Jumblat is a key member, has accused the riots of being “inspired by Iran and executed by Hizbullah”. March 14 usually blame Iran and Syria for their woes and the ‘opposition’ usually blame Israel and the United States. Jumblatt’s move is a great example of the bitter rivalry between the main political groups here, March 14 and the ‘opposition’. The tension has been brewing for months- Lebanon has been without a president since last November because agreement over the formation of a national unity government and an electoral law cannot be reached. Alot of news agencies are saying gun shots and explosions were heard in Beirut, but I myself heard nothing out of the ordinary. There are usually alot of sounds here that one could mistake for violence, but usually turn out to be fireworks, back-firing engines, exploding gas canisters, so perhaps I just didn’t notice.